Brenham High School - Volz & Associates Inc.
Brenham High School was designed in the Classical Revival style by the Austin architectural firm of Giesecke and Harris. The character-defining features include a symmetrical facade with restrained classical ornamentation, red brick veneer with cast stone detailing, steel casement windows, and a strong parapet at the roof line. The building served as a high school until 1964, a middle school until 1987, and currently is a community education building. 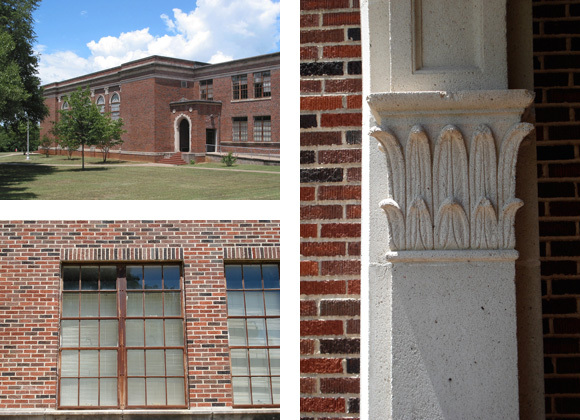 Considering it to be underutilized, the Brenham Independent School District commissioned our firm to study the condition, challenges, and best use of the building. For the public engagement portion of this project we partnered with the National Trust for Historic Preservation’s Historic Neighborhood Schools Initiative, which brought a national perspective of school rehabilitation to the local level.